"It was on November 13th,1981, from an improvised studio in the quarry area of UH Mānoa. A switch was thrown, several buttons were pushed. And out came the lush and wild strains of Mahler's "Das Lied von der Erde." Hawaii Public Radio was finally on the air!" 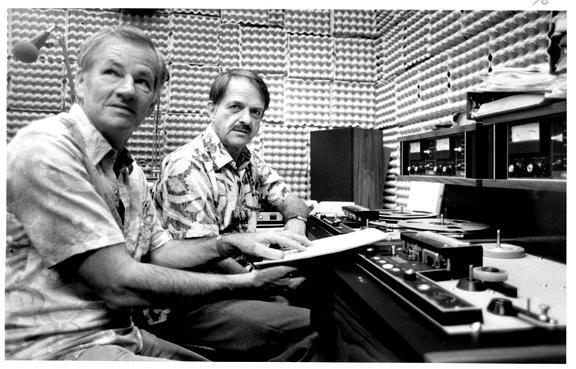 HPR's first News Director Bob Miller and founding General Manager Cliff Eblen in HPRʻs "ur-studio" lined with egg cartons for acoustic baffling. 1976: A group of citizens come together to incorporate a nonprofit organization, which they called Hawaii Islands Public Radio. Progress was slow at first, efforts were scattered, goals were unclear. 1979: The board realizes it needs to involve some business and cultural leaders. Businessman John Henry Felix is named chair of the new board. 1980: Cliff Eblen is invited to join the staff as manager. A founding member of Hawaii Public Television, he has considerable experience in the Wisconsin public radio system before moving to Hawaiʻi in 1966. He begins his new position at HPR on August 1. 1981: Then UH President Fujio Matsuda had offered studio space to the budding community-licensed station in the old Varsity Building, near Klum Gym on UH Mānoaʻs lower campus. The staff– of two!–moves in on June 20. The transmitter site on Wiliwilinui Ridge had already been determined. The HPR antenna would go on the tower already in use by Radio KIYE (now KRTR). On November 13, 1981, recognized as HPRʻs founding date, KHPR 88.1 FM goes on the air with Gustav Mahlerʻs "Das Lied von der Erde." During this period, the station signs off at midnight, turning the antenna off by remote control, and returning to the air at 4:30 a.m. for Morning Edition. The remote doesnʻt always work; engineers have to be sent to the site by helicopter to reset the switch more often than not; winds and storms donʻt' help. 1985: One of public radio's earliest stars, Garrison Keillor, comes to Blaisdell Concert Hall to broadcast his A Prairie Home Companion. 1986: Coverage is boosted on Oʻahu's North Shore and parts of Kauaʻi with the addition of a repeater transmitter on the top of Mt. Kaʻala. The first major capital drive begins in 1986, aimed at finding bigger and better studio space, acquiring more equipment, and building a station on Maui. 1987: HPR moves into its current headquarters at 738 Kaheka Street (July). 1988: Statewide coverage begins when KKUA's transmitter on Haleakalā brings KHPR's signal to Maui and parts of Hawaiʻi Island (April). 1989: The second program stream, KIPO 89.3 FM, begins broadcasting jazz and folk music (October). 1990: A third service, KIFO 1380 AM, begins broadcasting, simulcasting with KIPO for the most part. 1992: National Public Radio pioneer Al Hulsen joins the station as manager. 1996 - 1998: Anna Kosof serves as station manager. 1999: Michael Titterton becomes president and general manager (January). Expansion continues and a long hoped-for transmitter bringing the KHPR classical music and news program stream to East Hawaiʻi becomes a reality. Titterton encourages and assists the formation of the Big Island Friends of Public Radio, a group of citizens very similar to the group that founded the original Hawaiʻi Public Radio on Oʻahu. They organize to raise funds to pay for the transmitter expenses. In 2001,the station begins online streaming of KIPO, which had not been received on neighbor islands or on some parts of Oʻahu. Additionally during this period, HPR makes a significant step towards self-sufficiency. More than 65% of HPR's support now comes from individual membership. There is also a re-organization of the station's infrastructure. 2004: The cast and crew of the Public Radio International hit program From The Top come to Honolulu for a live taping at the Hawaii Theatre (December). Seven talented pre-college-age musicians from Hawaiʻi appear on the show, which is broadcast nationally in February 2005. 2006: From the Top returns to Hawaiʻi as part of the 25th anniversary season of the HPR network, this time performing once in the Hawaii Theatre and then at the MACC's Castle Theater in Kahului. Both shows receive national broadcast. Fred Child, the host of NPR's Performance Today, visits HPR as part of the same 25th anniversary celebration, hosting concerts and live broadcasts (March). The 25th anniversary celebrations culminate with two sold-out performances of A Prairie Home Companion at Blaisdell Concert Hall (November 11). 2007: From the Top returns to both Honolulu and Kahului, Maui (November). Kiyoe Wellington, a contrabass soloist, goes on to appear on From the Top from Carnegie Hall, the first Hawaiʻi resident to do so. Mortgage is paid off. Station has been completely debt-free ever since. 2008: The rebuild of KIPO 89.3 is completed, partially financed by the sale of AM station KIFO in 2002. The transmitter site on Puʻu Ohiʻa (Tantalus) is complete and goes on the air on September 20. KIPO's signal is now the equal of that of KHPR on Oʻahu. Two new boosters are installed on Mt. Kaʻala on Oʻahu's North Shore, and beam both KHPR 88.1 and KIPO 89.3 at the terrain-shielded North Shore, as well as at the south and east shores of Kauaʻi (June). 2011: HPR's first statewide programming initiative debuts: public affairs talk program The Conversation, co-hosted by Beth-Ann Kozlovich and Chris Vandercook (February). Expansion of the KIPO signal to Maui has finally been implemented and KIPM 89.7 goes on the air in the spring after an enthusiastic and successful local fundraising effort to support costs. KIPH 88.3 serving Hāna, Maui begins service shortly after. KHPR 88.1 relocated from Wiliwilinui Ridge, where repairs and maintenance required helicopter access, now co-located with KIPO 89.3. at Tantalus facility. Two New Yearʻs eve performances of A Prairie Home Companion from the Blaisdell Concert Hall, part the station's 30th anniversary celebration, are recorded for national broadcast. 2012: In the spring, a rebranding of the two HPR program streams takes place, with HPR-1 covering the classical music and fine arts stream, and HPR-2 enveloping the news, talk shows, current events, and jazz stream. The station receives the highest four-star rating for fiscal responsibility by Charity Navigator, the nationʻs premier independent charity evaluator. Also recognized with DEI Benchmarks Award for excellence and strength of community support. HPR launches its free mobile app for both HPR-1 and HPR-2. From its various digital platforms, HPR now has listeners all over the world. KIPL 89.9 (Līhuʻe) goes on the air, making available HPR-2ʻs news, talk, and international music available to the majority the remaining areas of Kauaʻi island. Large capacity back-up generator installed at Kāheka Street main broadcast facilities. All major broadcast sites now equipped with back-up capacity to ensure over-the-air service during times of emergency. The station receives for a second consecutive year Charity Navigatorʻs highest ranking for sound fiscal management and commitment to accountability and transparency. Only 18 percent of charities across the nation have received two consecutive four-star rankings. In Hawaiʻi, only two other nonprofits were rated as "exceptional" for fiscal year 2012; HPR was alone in the category of "arts, culture, humanities" and "public broadcasting and media." For the first time in the stationʻs history, the fall 2013 fund drive sets a target goal of more than one million dollars. It is successfully met. HPR receives one of the single largest individual gifts of $100,000. The donor requests that his premium – one million frequent-flyer miles from Hawaiian Airlines – be transferred to benefit neighbor island children and families needing the specialized care available at Kapi‘olani Medical Center for Women and Children. The Radio Flyers program is launched with fall's Celebration 2013 drive, and this re-gifting option proves to be popular in this and subsequent pledge drives. The station introduces the Sustaining Membership program of ongoing monthly giving, in order to provide a reliable income stream and eventually shorten the length of pledge drives and reduce pledge goals. 2014: Rising costs require an increase in the amount needing to be raised in the spring fund drive. The community responds and helps HPR meet its $1.03 million goal. HPRʻs news team, the largest for a radio station in the state, is awarded three prestigious Edward R. Murrow awards. For the fall fund drive, the pledge goal amount is unchanged from the spring drive, due in part to the growing base of sustaining member support. After suffering a shortfall at the drive's anticipated end, the station receives an outpouring of community support and Celebration 2014 concludes after a brief extension, raising a record-breaking $1.039 million. In December, HPR is awarded its third consecutive four-star rating by Charity Navigator. The station is one of five Hawaiʻi-based nonprofits to be recognized with this top distinction. 2015: A location for the HPR-2 East Hawaiʻi transmitter is secured on a tower previously owned by HawaiianTel at Kulani Cone. The completion of the statewide network of two program streams is moving forward. HPR is named one of the 2015 Best Places to Work in Hawaii by Hawaii Business magazine and Best Companies Group. HPR's news team wins two national Edward R. Murrow Awards, three regional Murrow awards, as well as an APTRA (Associated Press TV and Radio Award). Charity Navigator recognizes HPR with its fourth consecutive four-star rating in November. Only nine percent of charities evaluated by this largest independent charity evaluator achieve this top ranking four years in a row. HPR wins the Cades Schutte - The Cades Foundation Nonprofit Leadership Award, one of the Business Leadership Hawaii Awards administered by Pacific Business News. HPR was recognized for the growth in its membership numbers, the level of giving it receives from a relatively small population base, its balanced budget, and financial stability. Read more. 2016: In June, Michael Titterton is succeeded by José A. Fajardo as HPR President and General Manager. HPR earns with its fifth consecutive four-star rating in October. Only six percent of charities evaluated by this largest independent charity evaluator achieve this top ranking five years in a row. On October 26, the East Hawai'i transmitter on Kulani Cone signed on. This marked the completion of the station's long-held goal to serve the entire state with two streams. From the Top returns for live tapings at Kamehameha Schools Hawaiʻi campus (Keaʻau, Hawaiʻi) and the Blaisdell Concert Hall in Honolulu. 2017: On February 14th, HPR reformats its two stations. HPR-1 is now the news, entertainment, jazz, blues, and world music stream. HPR-2 is your home for classical music. A refreshed mobile app is released at the same time. The Maui transmitter was relocated from ʻUlupalakua to Haleakalā and went on the air in August. Its new elevation allows for better line-of-sight transmission resulting in improved reception to previously terrain-shielded areas on Maui, Molokaʻi, and the west side of Hawaiʻi island. In October, the station receives its sixth consecutive top award from Charity Navigator. Host of Science Friday, Ira Flatow, makes his first live appearances in the islands in presentations titled "First Take with Science Friday." The two tapings before audiences of HPR station members in Honolulu (at the Hawaii Theatre Center, July 6) and in Waimea, Hawaiʻi island (a sold-out house at the Kahilu Theatre, July 7) feature six scientists doing innovative work here in the state, as well as musicans Makana and The Red Water Trio. In August, the station receives its seventh consecutive top award from Charity Navigator. The charity evaluator also selects HPR for its top ten public radio stations -- HPR's rating puts it at the top of the list. Also in August, HPR presents "The Best of Aloha Shorts - Live!" to a sold-out audience at Palikū Theatre. A larger back-up generator is installed at the Tantalus site in the fall. This will reduce disruption of service during electrical blackouts and provide an alternate source of power even for lengthy outages. 2019: For the first time HPR mounts a Neighbor Island tour of a live performance event that began as a station-produced program, Aloha Shorts. An updated version of "The Best of Aloha Shorts - Live!" is presented in Hilo (Feb 8), on Maui (Feb 9), and on Kauaʻi (Feb 16). The readings are accompanied by musicians from each island: Mark Yamanaka, Pat Simmons Jr., and Kirk Smart, respectively. Listener support for Hawaiʻi Public Radio (and all public radio) has increased steadily, gaining in momentum particularly over the past few years. 94% of our funding is raised locally. Increasing numbers of listeners over the past years have led to concomitant increases in programming expense, as the cost of programming is determined by the number of listeners. Each week, 195,000* people listen to HPR programs. And each year, over half a million dollars is spent on NPR programming alone. Our current annual budget is approximately $6.5 million. Thanks to the generosity and vision of our more than 14,600 members (more than 50% of them Sustaining Members), HPR has been able to keep our statewide network operating in the black.